I'm Mickey and I own a diner & bar in Tokyo where you can spend relaxing time with an affectionate Akita dog. You might know the Akita dog breed from the popular story about the loyal dog Hachiko, featured also in a Hollywood movie starring Richard Gere. I have been managing this diner & bar for over 10 years. The affectionate pet Hayate has won many awards and has appeared numerous times on TV and in magazines. 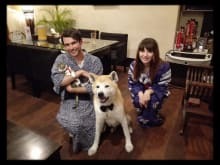 Come to my place and enjoy a wonderful time with Japan's most popular dog! We chose to 'drink' with Haya-chan and Basara, and I thought the tea and snacks we got were delicious! The owner was absolutely lovely, she asked us a lot about our visit and let us spend as much time with the Akita dog and kitten as we wanted! The photos taken were SUPER CUTE! It was a pleasure meeting everyone! I had an amazing time at this activity. The hosts were kind and funny and The Akitas were cute and friendly! The food was delicious! Will be sure to return when I next come to Japan! I was glad to have met Mickey-san; she was very friendly and hospitable. The food was good; the portions are generous! The star of her restaurant is 13-year-old Hayate (also nicknamed Haya-chan), a friendly, smart Akita dog who isn't shy around strangers. You can even help feed him (ask Mickey-san for permission first, of course!) and play with him. He sat under my table the whole time I was there, and I even got to hug him. There's also a new addition to the restaurant - a playful 3-month-old kitten named Basara, who is also adorable! She's very energetic, although Hayate doesn't like her much. Mickey-san and I had some nice conversations, and she helped me wear my yukata. I was very satisfied with my experience, and I would definitely like to visit her restaurant again! I love passing time with haya-chan. The hostess was a really amiable person. And made it happen really smooth, since haya-chan was a little sleepy. The tea really good I recomend the experience.